They are the ONLY Professional Smoothing Treatment that actually improves the health of the hair. No Damage! Brazilian Blowout Açai Styling Products are specially formulated to promote smooth, frizz-free, healthy hair while delivering the optimal styling results: stick-straight tresses, added definition, increased shine or a boost in volume! 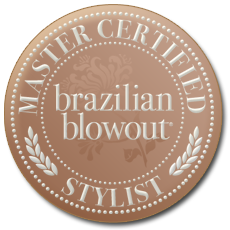 Brazilian Blowout introduces two new styling products! The Protective Thermal Straightening Balm and the Instant Volume Thermal Root Lift. m these treatments on clients with specific challenges: extra frizzy hair, extra short hair, hair extensions, etc. Stylist will shampoo your hair with the Brazilian Blowout specially formulated Anti-Residue; Professional Shampoo to prepare your hair for the optimal smoothing result.